The I-405 toll-lane experiment: How’s it working for drivers, and the state? It’s been more than a year since the state opened the 17-mile toll corridor along Interstate 405. It offers a quicker drive for those willing to pay up to $10 a trip, but has angered many drivers still stuck in heavy traffic. Each weekday morning, thousands of Eastside commuters have to decide what’s more important, time or money. They can suffer in the crowded general traffic lanes of Interstate 405. Or they can choose the quicker left lane and pay tolls that average $3 — but reach the $10 maximum for at least a few minutes most weekdays. Now in their second year, the I-405 express toll lanes succeed for some people and fail for others. Kinks are still being worked out. 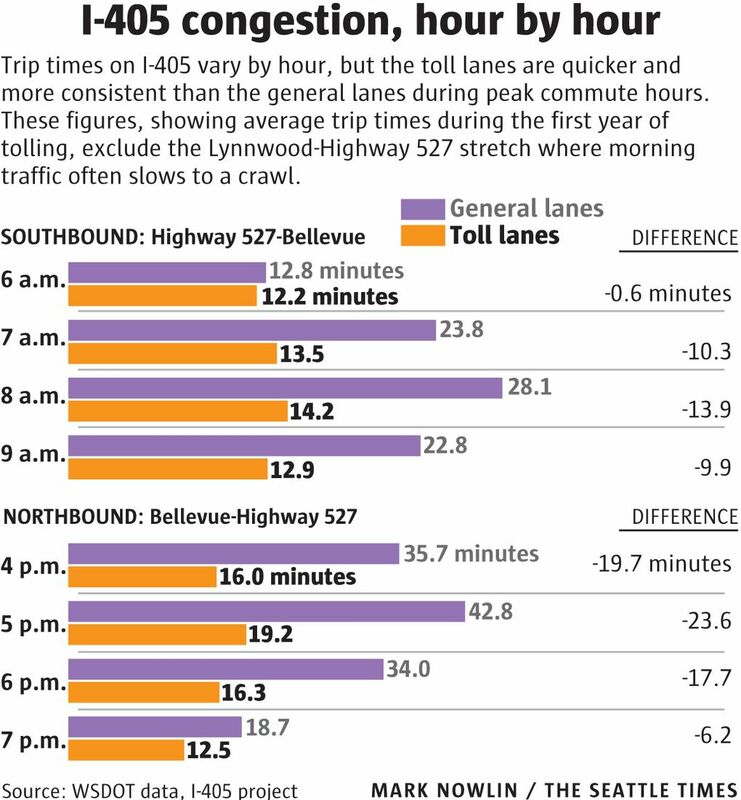 Even drivers who don’t use the toll lanes save an average of five minutes in the morning for the 17-mile trip from Lynnwood to Bellevue, and the freeway serves more people than ever before, official reports show. But for residents of Snohomish County passing through, the former chokepoint in Kirkland has merely shifted north into Bothell. Just like the Interstate 5 slog into Seattle, trips on I-405 south into Bellevue sometimes still exceed one hour in the general lanes. That’s mainly because the state settled for having only one toll lane and two general lanes in each direction between Bothell and Lynnwood — a move that caught legislators and the Washington State Department of Transportation (WSDOT) by surprise, when jobs and traffic growth roared back sooner than expected after the recession. The $462 million project changed the free carpool lane into a toll lane, while creating a second toll lane from Bellevue to Bothell. New ramps to reduce weaving also were added. The total cost includes lane and ramp improvements in Kirkland that were completed earlier. But lawmakers didn’t allocate money to widen the tight sections over the Sammamish River at Highway 522 in Bothell. Within weeks after the September 2015 opening, 32,000 people had signed an online petition to cancel the tolls. Now, more than a year later, 51,000 drivers per day use the toll lanes, saving an average of 11 minutes southbound and 14 minutes northbound at peak times, end-to-end, compared with the general purpose lanes. Traffic Lab is a new Seattle Times project that digs into the region’s thorny transportation issues, spotlights promising approaches to easing gridlock, and helps readers find the best ways to get around. The project is modeled after our successful Education Lab, launched in 2013 with foundation funding to delve into some of the most persistent challenges in public education. As the business model for newspapers shifts, The Seattle Times continues to look for alternative ways to pay for our public-service journalism. Traffic Lab is funded with the help of community sponsors Alaska Airlines, CenturyLink, Kemper Development Co., Sabey Corp., Seattle Children’s hospital and Ste. Michelle Wine Estates. Seattle Times editors and reporters operate independently of external funders who support our work. We maintain full editorial control over Traffic Lab content. In the coming weeks and months, our team will examine issues large and small. We’ll look closely at the massive transportation projects under way and explore innovative solutions to highway congestion. We’ll design "commute makeovers" for those who are sick of being stuck, and we’ll have some fun with traffic trivia. Because we all have to get around, we want readers to help guide our coverage. Send your questions, tips and story ideas to trafficlab@seattletimes.com. Feel free to leave your thoughts or questions in the comments below. And look for future reader call-outs as we ask for your input on specific transportation issues. Transit agencies that also use the toll lanes say ridership is growing as buses spend less time in traffic. Despite continued opposition from some state lawmakers, the lanes will be given another year to prove themselves. House Transportation Committee Chairwoman Judy Clibborn, D-Mercer Island, says she won’t hear a bipartisan bill filed by Rep. Mark Harmsworth, R-Mill Creek, to repeal the I-405 tolls. The state is striving to add capacity by springtime, by turning the northbound right shoulder into a traffic lane from the Canyon Park area to Lynnwood for the afternoon commute. That won’t cure the chokepoint at the Highway 522 junction in Bothell. Nor would it defuse populist complaints that the wealthy can zoom by in “Lexus lanes” while others tap their brakes. “My big picture is, we have thousands of constituents who are sitting in that north end of 405 traffic, that has definitely gotten worse,” said Rep. Gerry Pollet, D-Seattle, whose district includes Kenmore. I-405 tolls routinely exceed the $4 state managers said would be a normal weekday max. Commuters are thinking, “I can’t do that every day,” Pollet said. Someone who did is Sheri Clarke, who wrote to thank the state, despite often paying $10 a trip commuting from Mukilteo to work at Puget Sound Energy in Kirkland, before she moved there last fall. The reliability of toll lanes allowed her an extra half-hour of sleep before night shifts, or a quick return home after day shifts. Even if you don’t drive I-405, what happens there may affect the evolution of more toll corridors, including new segments of Highway 509 and Highway 167 — or even I-5 someday. On I-405, the Legislature has approved plans to spend $1.2 billion adding toll lanes from Bellevue to Renton by 2024, providing two general lanes and two toll lanes each way. 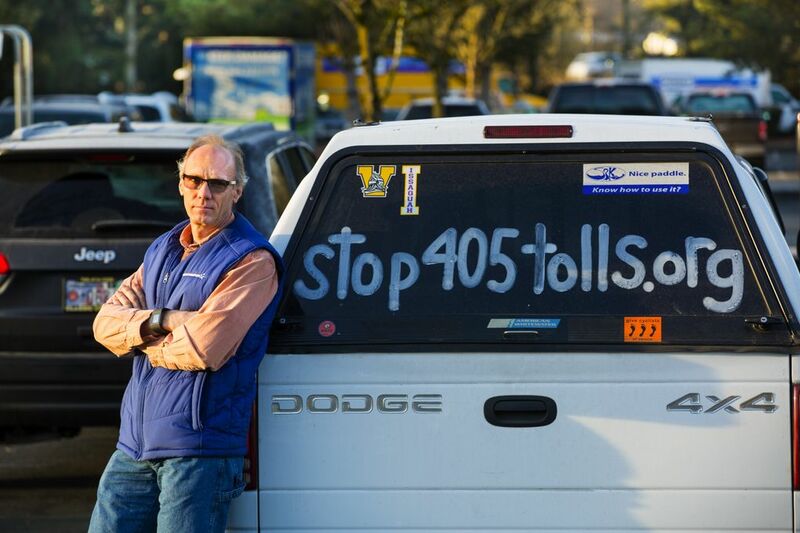 David Hablewitz has written “Stop405tolls.org” in white shoe polish on the canopy of his old pickup, which slowed to a standstill leaving Lynnwood on a chilly Tuesday last month. 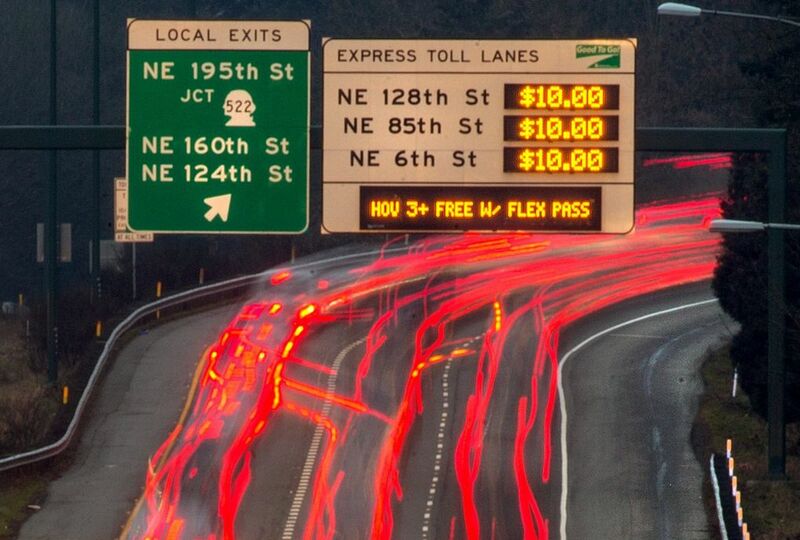 “This is what the people coming from Snohomish County deal with on a daily basis,” said Hablewitz, a Bothell resident and leading critic of the toll lanes. By the time he reached the Canyon Park interchange, in the left general lane, the toll to Bellevue had climbed to $8.75. • The toll lanes collected $15.6 million after operating expenses — triple the expected income. By law, that money must be reinvested in I-405. • Tolls hit the max $10 for at least a few minutes on 55 percent of commute days. • Peak-time drivers saved an average 14 minutes by choosing toll lanes from Lynnwood to Bellevue. • General-lane travel speeds were faster through Kirkland, but time savings vanished for northbound drivers who hit afternoon snarls in Bothell. • Among pass holders, 82 percent used toll lanes 10 or fewer times a month. Between 50,000 and 70,000 drivers a month were first-time users. A car escaping the toll lane swerved in front of Hablewitz, who was going 25 mph. His roughly 10-mile drive from Lynnwood to Totem Lake took 30 minutes. Motorists trailing behind in Lynnwood saw a $10 toll sign by 7:30 a.m.— a clue the lanes were clogged and WSDOT needed to deter cars from entering. Hablewitz is outraged that the state kicked two-person carpools out of the formerly free left lane unless they pay tolls. He often combines a work trip to Bellevue with taking his daughter to school in Issaquah. To help the lanes flow, WSDOT raised to three the number of people required for free entry. Fewer than a quarter of toll-lane vehicles are carpooling. The goal is an efficient 45-mph flow, the speed that moves the most cars per hour, like rice poured through a funnel. The state reports it’s meeting that standard 88 percent of the time, just short of the 90 percent required by federal and state law to receive certain funding, but better than 59 percent in the old carpool-only lanes. Bill Popp, a traffic engineer and member of the pro-highways Eastside Transportation Association, says people shouldn’t be impressed by state figures — after all, total lanes increased from four to five each way in Kirkland at taxpayer expense, and to save serious time, you must accept “double taxation” by paying tolls. “The benefits would be more fairly and efficiently distributed if that capacity were in the form of general-purpose lanes,” he argued in a Jan. 9 letter to Eastside elected officials. WSDOT tollway engineer Jennifer Charlebois says that over the 17-mile corridor, road space increased 12 percent, and the system is coping with a post-recession spike in traffic far worse than other Seattle-area freeways. Volumes through Kirkland increased 14 percent this past year. The opponents’ deeper grievance is WSDOT’s failure to carry out its 2002 master plan that called for two additional general lanes each way on I-405. “We’re driving on what is a rural highway in the middle of an urban area. They have to increase capacity,” Hablewitz said. Sooner or later, more general lanes would fill, studies show. Even the 26-lane Katy Freeway in fast-growing Houston bogs down after each widening. “The fact that if we add two lanes there will be no congestion, that’s total (nonsense),” says Mark Hallenbeck, director of the Washington State Transportation Center, a research group at the University of Washington. Bunching would still happen at the prime hour around 8 a.m., he said, and if afternoon drivers zip through Bothell, they’d just wind up braking in Lynnwood, unless the congested I-5 segment there expands. Early data from I-405 show the public is better off than before, because an option exists to buy a faster trip, Hallenbeck said. “People have demonstrated they are willing to pay a lot for better transportation service,” he said. About 82 percent of Good to Go toll pass users paid a toll 10 or fewer times a month, which indicates drivers of all incomes selectively “use the lanes when they need them,” the state says. “The big problem that exists is still the five-lane to three-lane lane reduction at 522” in Bothell, Hallenbeck says. “There’s so little the state can do about it without an infusion of money. “Does that make the project a failure? No. Last decade, politicians hoped tolls would be an elixir to finance more highway capacity. The George W. Bush administration promoted tolls to replace gas taxes, as cars become more fuel-efficient. The Obama administration gave Washington state millions to buy toll equipment. Toll roads are proliferating, thanks to electronic collection technologies that eliminate the need for cars to stop at a booth. Peak hours are 5-9 a.m. southbound, 3-7 p.m. northbound. Corridors similar to I-405 will double in five years, to 750 lane-miles operated by 31 toll agencies, according to the influential engineering firm Parsons Brinckerhoff. Traffic on all kinds of U.S. tollways, including toll bridges like Highway 520, grew 3.3 percent in 2015, to 5 billion trips, says the International Bridge, Tunnel and Turnpike Association. In Washington state, where highway construction costs are among the nation’s highest, I-405 consultants learned tolls would pay only a fraction of the $462 million spent on the toll lanes and related projects. WSDOT changed its prime goal from financing more road capacity to managing congestion. But tolls are making money. First-year net income was nearly $16 million or triple the state estimates, and is trending toward $22 million this year. “They’re so popular. We keep raising the tolls, and they don’t move out,” Clibborn said. State transportation commissioners have discussed raising the toll cap to $15, but not this year. In northern Virginia, where no limit exists, the rate hit $29 recently. Toll windfalls are helping Clibborn and Gov. Jay Inslee pay for adjustments like the Bothell shoulder lane, to aid Eastside commuters. Clibborn would double down by selling toll-backed bonds next year, to pay for additional improvements. A $22 million annual toll stream might be enough to sell bonds for half of the $450 million next phase suggested by WSDOT: extend the second toll lane each way from Bothell to Highway 527 at Canyon Park, widen overpasses and build center on-ramps for carpools and toll payers. Gov. Jay Inslee has asked for federal aid in a wish list sent to the Trump administration. A bond sale would lock in tolls for a quarter-century because the state must guarantee enough income to repay investors. “Generating revenue means keeping congestion at current levels,” laments Mariya Frost, transportation analyst at the Washington Policy Center, a free-market think tank in Seattle. Harmsworth, the Mill Creek lawmaker, says he opposes toll-backed bonds and the state should tap Sound Transit 3 tax increases instead, since new toll ramps and lanes would be used by ST3’s bus-rapid transit. Voter passage of ST3, which promised more park-and-ride stalls and bus ramps along I-405, further cemented the toll lanes politically. To have any hope of winning riders, not to mention federal grants, the freeway must offer buses a 45-mph guarantee, which the old free carpool lane didn’t accomplish. “There isn’t going to be a light rail through this section anytime soon. Bus-rapid transit has to work,” said Kim Henry, the state’s I-405 project director. For the time being, he’s focused on the new afternoon shoulder lane, to open sooner and cheaper than expected. Henry also admits some concern that congestion may just move 1¾ miles north, where that new lane would end at the I-5 Lynnwood junction.